AUSTIN, Texas (August 10, 2017) -- Lourdes Matute of Chicago, who’s entering her senior year at the University of California, Berkeley, has won Self Lender’s $1,000 Scholarship for Aspiring Entrepreneurs. Matute was chosen from among nearly 100 applicants. 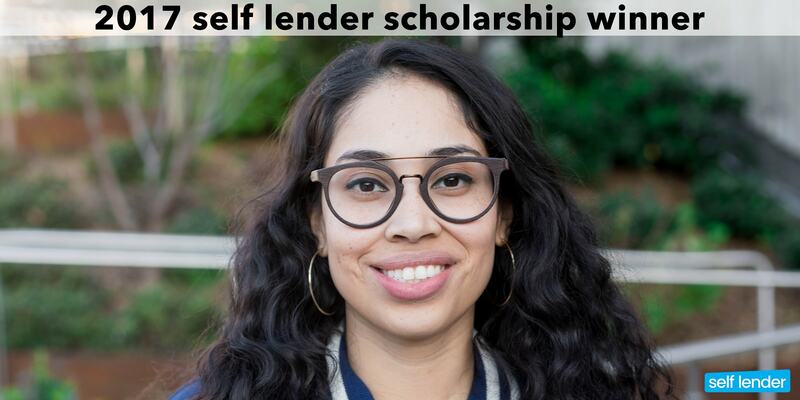 “Self Lender hopes this scholarship aids Lourdes in achieving her financial and collegiate goals during her senior year at UC Berkeley as she moves on to her MBA program. We’re excited to see the great things she’ll achieve with a little help from the Self Lender scholarship,” said James Garvey, co-founder and CEO of Austin, Texas-based Self Lender. Self Lender helps thousands of people begin their financial journey with credit building accounts. Matute is typical of the types of people who benefit from Self Lender’s offering. In her scholarship application, Matute wrote that she was “terrified of credit” and of “falling into a financial trap that would bind me in a web of debt for the rest of my life.” She said her fear of credit stemmed from a lack of knowledge. Matute’s fear of credit and lack of credit knowledge are common across college campuses. Her drive to teach herself about credit and take control of her financial future exemplifies the mission of Self Lender to help people learn about and take control of their finances. Like so many Americans, Matute came from a family that stressed over money. With a mission to help break the cycle of poverty in the inner city, Matute made it her goal to seize control of her financial journey through learning. Matute began to build her knowledge with the help of friends, financial educators, websites and Facebook interactions. This took the mystery out of credit and gave her the confidence to change her financial habits for the better. Last year, she earned the Credit Business Associate (CBA) designation from the National Association of Credit Management. Today, Matute freely starts conversations with her peers about credit and personal finances. Recognizing that ignoring the issues and sweeping conversations about money under the rug won’t help break the cycle of poverty, she won’t let her peers off the hook when it comes to discussing personal finances. Financial freedom is a community effort, and Matute strives to bring financial freedom to her community. As a first generation college student from a low-income inner city community, I feel a sense of responsibility for breaking the cycle of poverty in my family. Put simply, this cycle consists of working hard, barely making ends meet, and never having enough money to save. The cycle of poverty made it taboo to talk about personal finance so I watched in silence as my parents stressed over money. I was terrified of credit; of falling into a financial trap that would bind me in a web of debt for the rest of my life. My relationship with credit - and with personal finance more generally - has evolved because I searched for and have implemented tools to lead a financially free life. My fear of credit was based on my lack of knowledge--so I began there. I asked credit "101" questions from the most financially responsible people in my network. I followed the work of financial educators like Ramit Sethi, religiously read Nerdwallet, and completed The Budgetnista's Live Richer Challenge--this guide pointed me towards Self Lender. By building knowledge of credit and how it worked, I was able to demystify it and create an action plan to optimizing my score. I strategically applied for credit cards so that the credit inquiries would have little impact on my score. I then set up automatic bill payments for my cards and calendar reminders so that I am also tracking manually. To keep my credit utilization at a healthy minimum, I make small recurring charges on my cards. I always have the total amount I charge on my credit cards in my debit account before I even consider using my revolving credit lines. One of my favorite tools is Self Lender because I'm able to build credit history while saving for a future investment. Today, I'm equipped with the knowledge and confidence to take control of my financial journey. I use my banks' applications and CreditKarma. I monitor my FICO score and budget for all of my expenses. I enjoy tracking, budgeting and planning my financial life. I've replaced the cycle of poverty with the Cycle of Financial Freedom. This cycle consists of: building knowledge, reprogramming money-related habits, managing one's finances closely and lastly, sharing good information. The information sharing piece is about paying it forward by encouraging others to take control of their credit. I believe this cycle has the potential to transform how communities interact with credit and finances, as it has for me. I'm known to start the uncomfortable conversations about credit and finances with my friends and family. I plant the seed and they often follow up with questions or request more information. There is a need and a desire to build this knowledge in my community. At my university, I have connected with peers who know very little about credit. Many are also the first to go to college in their families and they're where I was just a year ago. Because I know from personal experience, the fear associated with having to build this knowledge from the ground up, I started one-on-one mentoring to support my peers through the process. My only ask of them is to share good information with others so that we can keep the cycle of Financial Freedom going.